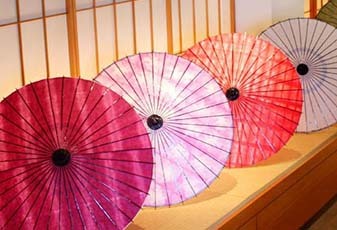 The Japanese parasol (Higasa) has an abundance of colors and patterns, and combined with decorated strings on the inner side, they give a bright impression. They are often used as a prop for dancing or as a sun parasol in summer to be used while wearing Japanese summer kimono (yukata) and also with western clothing. Furthermore, they are used on various occasions such as weddings and the 753 ceremonies for children, and always ensure a bright performance. 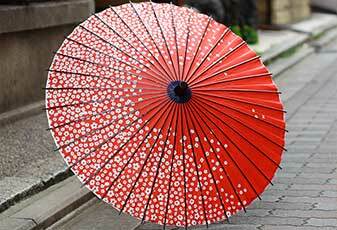 ※The Japanese parasol is not waterproof so cannot be used in rainy weather.